After being in service with W & J Riding for many years quite a number of the vehicles in the fleet were sold on to other operators where they carried on working for a number of years, especially the Foden's with many of them finishing up on the fairground circuit and are still in operation today. 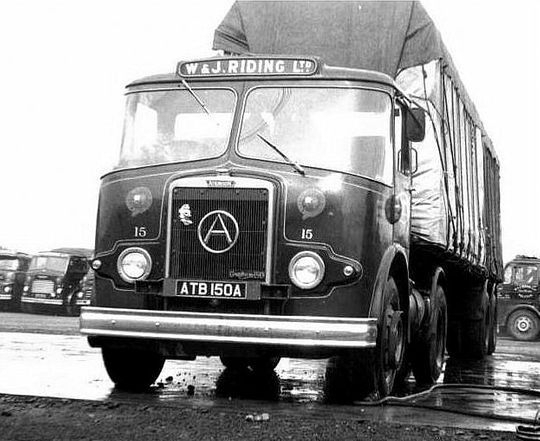 As regards the older vehicles, after their working lives at Riding's most were broken up and scrapped but fortunately a small number of the older Atkinson's escaped the blow torch and were saved for preservation. 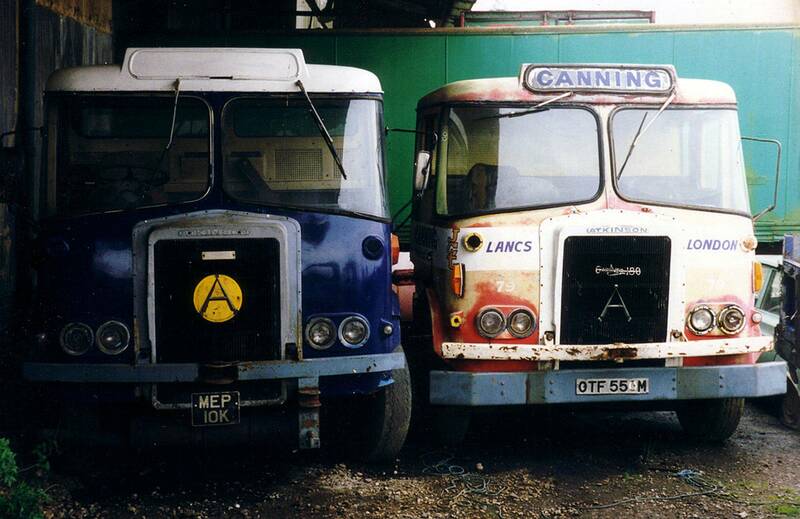 This section of the site looks at a number of these vehicles which later went on working for other companies. Atkinson Mk I Silver Knight 4x2 tractor unit Reg No ATB 150A Fleet No 15 was registered new to W & J Riding on the 1st of October 1963. 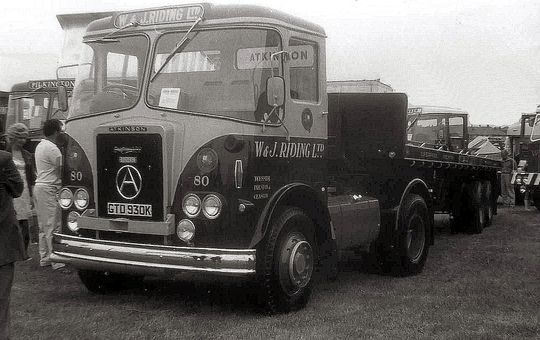 The second Atkinson Mk I 4x2 tractor to join the Riding fleet ATB 150A had the classic drive line of the day, a magnificent Gardner 150 6LX engine in line with a David Brown six speed gearbox and Kirkstall BDR rear axle. Later when the weight limit was increased to 32 tons the engine was uprated to a Gardner 180 specification. 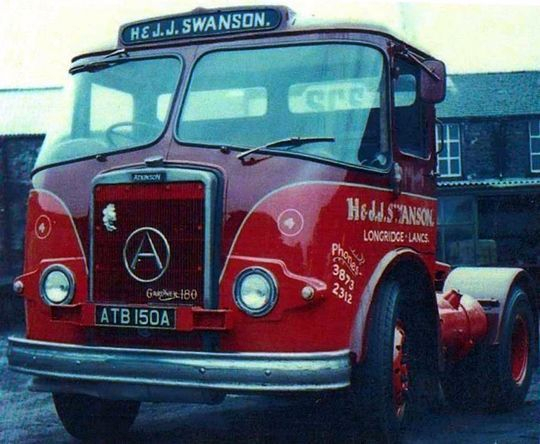 In October 1973 ATB 150A was sold on to Harold Swanson just down the road in Longridge for £909 plus vat. Harold had been a driver for W & J Riding but decided to strike out on his own and this was his first venture into artics. ATB 150A is seen here fresh out of Keith Woodward's paint shop in Harold's new livery. 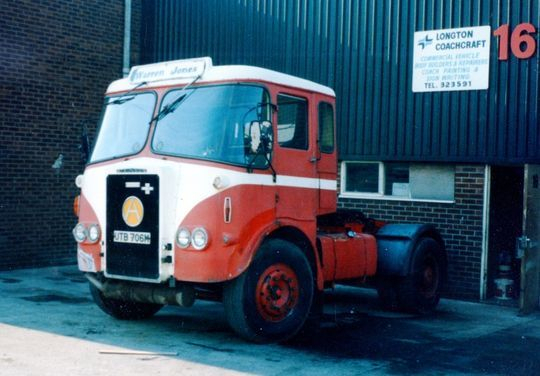 Atkinson Mk II Silver Knight 4X2 tractor unit Reg No TTE 760H Fleet No 69 'Loyal', powered by a Gardner 180 engine, was a brand new addition to the fleet on the 1st of September 1969 at a cost of £3,976 18s 8d. After seven years service on the Darlington trunk change over TTE 760H was withdrawn from the fleet in October 1976 and sold on to Bailee Freight Services of Yarm near Middlesbrough who repainted in their striking yellow and blue livery. 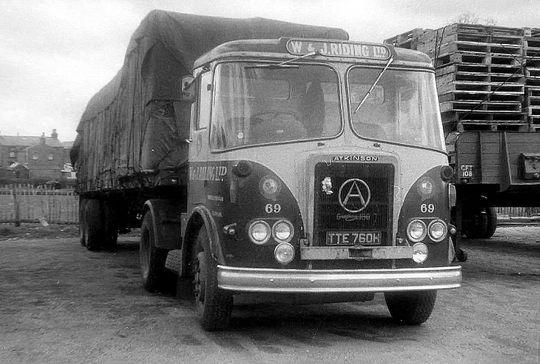 Atkinson Mk II 4x2 tractor unit Reg No ETF 510J Fleet No 77, powered by a Gardner 180 engine, was registered new to Riding's on the 5th of May 1971. Seen here when new in 1971 it was driven on a regular basis by the late Fred Wolstenholme, aka Pluto. It is pictured above at the premises of Hepworth Polva Plastics in Padiam near Burnley a company which manufactured plastic piping and guttering. 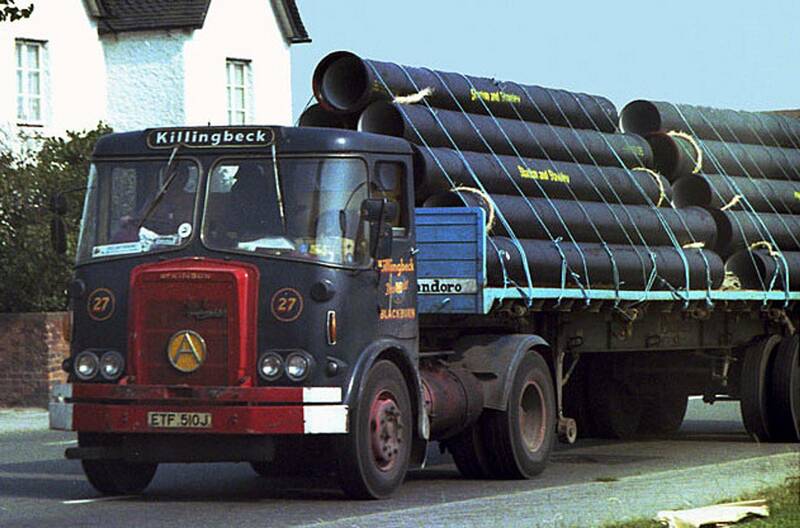 After a number of years service it was eventually sold on to Tom Riding's friend John Killingbeck of Blackburn. 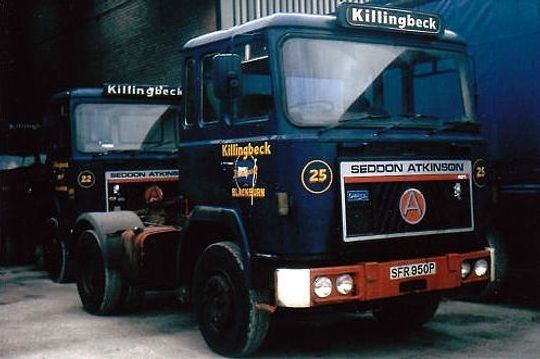 After being in service with Riding's for a number of years Atkinson Mk II 4x2 tractor unit Reg No ETF 510J was sold on to John Killingbeck of Blackburn were it became No 27 in the fleet. 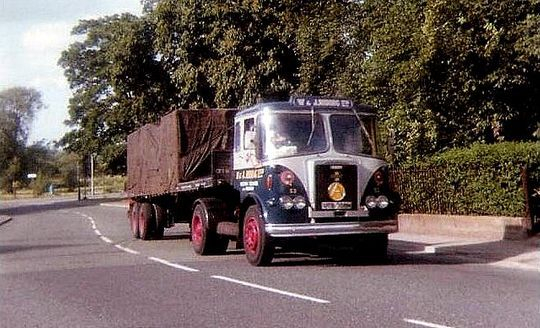 It is pictured here on the A50 at Longton Stoke-on-Trent while hauling a Pandoro flat trailer loaded with steel pipes from the long gone Stanton & Staveley plant at Ilkeston in Derbyshire. 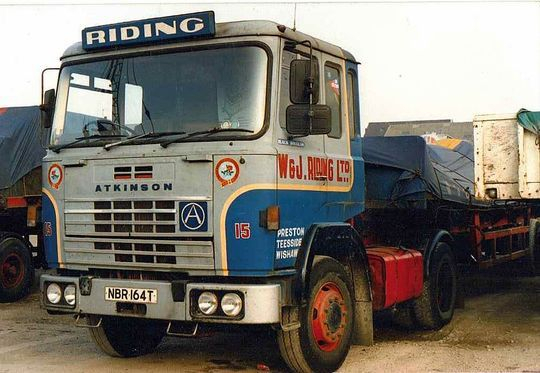 Atkinson Borderer 4x2 tractor unit Reg No GTD 930K Fleet No 80 'Alert' was one of the first brand new Atkinson Borderer's to enter service with the Riding fleet on the 1st of August 1971 at a cost of £4,912.51p plus vat. 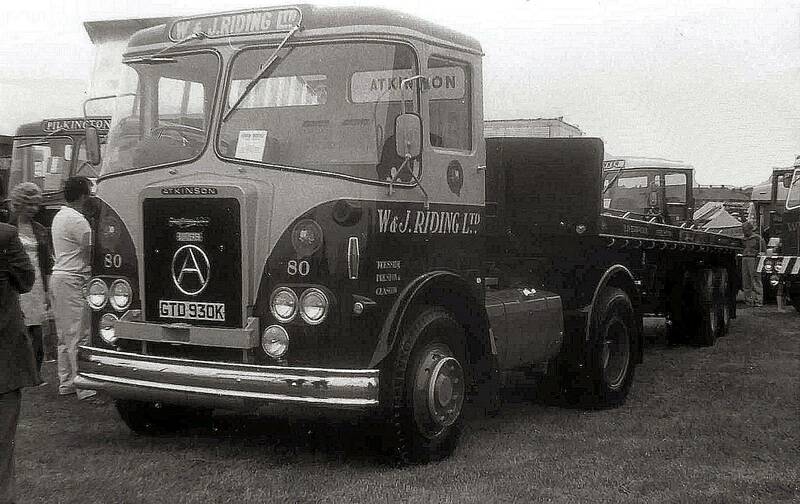 Driven from new by long time serving Riding's driver Paul Smith it is pictured above on the Atkinson Vehicles stand in 1971 at the Royal Lancashire Show shortly before entering service with the fleet. 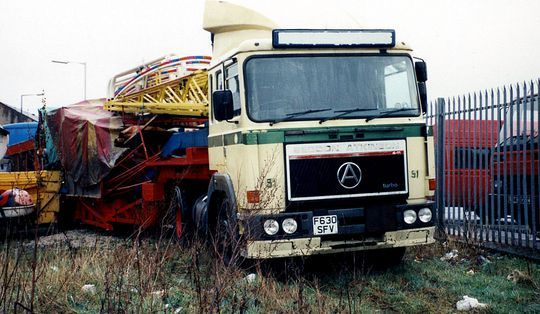 After seven years service with Riding's GTD 930K was sold on in July 1978 to local dealer Syd Hartley for £500 plus vat who in turn sold it on to a fairground operator who then ran it for a further 11 years as can be seen below. Having been sold on to local dealer Syd Hartley for £500 plus vat Atkinson Borderer Reg No GTD 930K finished up being purchased by a fairground ride opereator who utilised it as an electric generator. It is pictured here during a local fair at Selby North Yorkshire on the 1st May 1989. 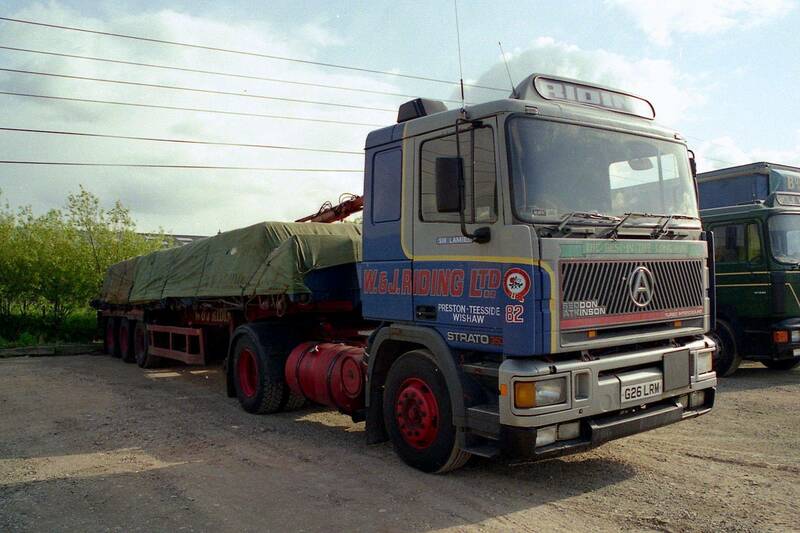 Six months after this picture was taken GTD 930K was taken off the road and scrapped in November 1989. Photograph courtesy of John Gibbs. 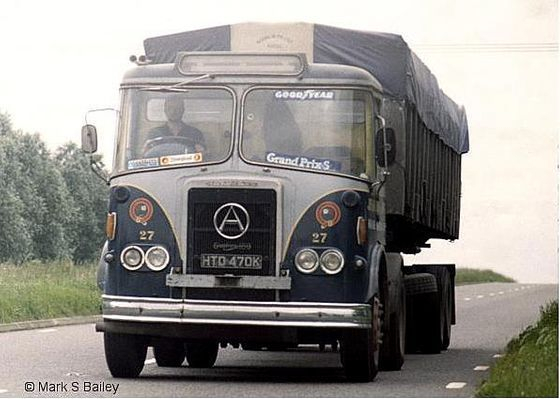 Atkinson Borderer 4X2 tractor unit Reg No HTD 470K Fleet No 27 'Competent' which was purchased new by Riding's in September 1971 at a cost of £4,802. Powered by a Gardner 180 it was driven from new by Bill Coolican, another of Riding's 40 year men, and originally pulled a 1450 cubic-foot Crane Fruehauf powder tanker on the ICI Ltd plastic contract. 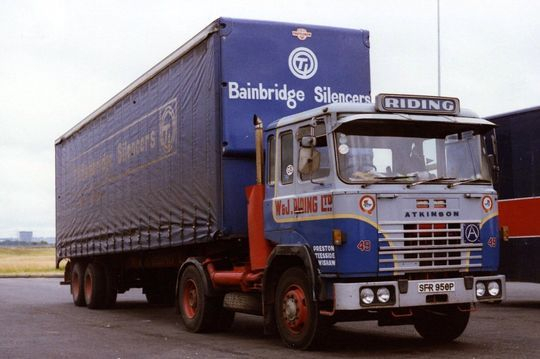 It is seen here parked in Keighley towards the end of its working life at Riding's after it had been assigned to the general haulage fleet. Not long after this picture was taken HTD 470K was to Mr Joseph Bateson of Hoghton near Preston on the 27th November 1980 for £700. After being in service with W & J Riding for just over nine years HTD 470K was sold on to a Mr Joseph Bateson of Hoghton near Preston on the 27th November 1980 for £700. It is pictured here being operated by it's new owner hauling a bulk feeder used for farm deliveries of animal feed-stuffs while the sign writing on the cab sides has also been changed as has the headboard. Photograph courtesy of Mark S Bailey. Atkinson Borderer 4X2 tractor unit Reg No PTC 440K Fleet No 8 'Faithful' was registered new on the 1st of July 1972. 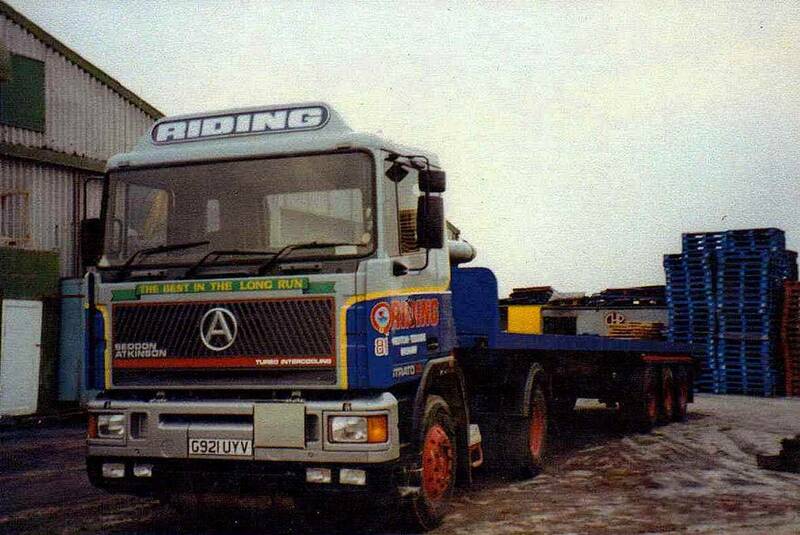 Powered by a Gardner 180 engine this particular tractor unit was in the Riding fleet for over 20 years. 1972 registered Atkinson Borderer 4X2 tractor unit Reg No PTC440K Fleet No 8 'Faithful' is seen here towards the end of it's working life at Ridings while being utilised as the yard shunter. Powered by a Gardner 180 engine it is pictured parked up in the depot at Longridge on the 29th of August 1993, when 21 years old. Fortunately PTC 440K was saved for preservation. After undergoing complete restoration it can still be seen today at various rallies across the country. 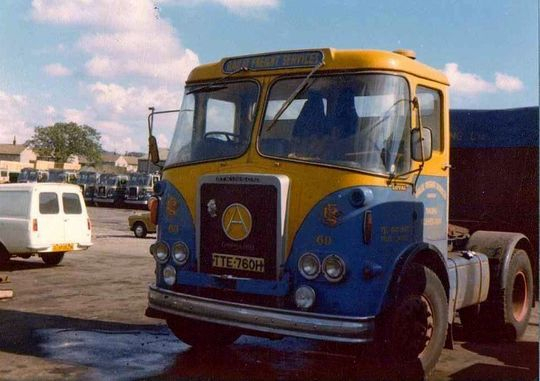 Atkinson Borderer 4x2 tractor unit Reg No OTF 550M Fleet No 81 'Robust', powered by a Cummins NH250 engine, was originally registered new tp Pandoro of Fleetwood on the 1st of September 1973. When purchased second-hand by Riding's it had one of Riding's own sleeper conversion kits fitted not long after the picture above was taken. 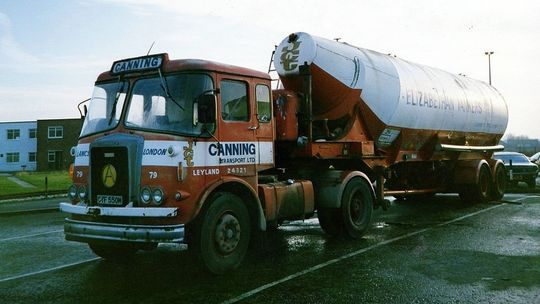 After being in service for a number of years with Riding's OTF 550M was sold on to another local operator by the name of J. Canning of Leyland who used it for hauling a tandem axle powder tanker. When J Canning of Leyland ceased trading OTF 550M was parked up in the Wainfleet yard of Kevin Dennis in Norfolk where it is pictured above awaiting restoration. Today, 45 years old and fully restored, OTF 550M can be seen at various rallies across the country in the livery of Morgan Transport. 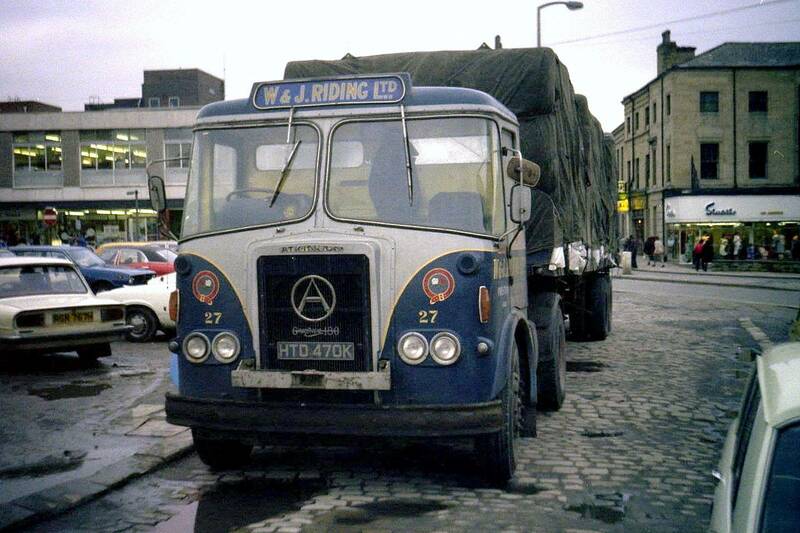 Atkinson Borderer 4x2 tractor unit Reg No UTB 706M Fleet No 53 'Iron Duke' was originally new to Pandora of Fleetwood on the 18th of March 1974. Pictured hauling a 33 foot crane Fruehauf trailer loaded with plasbins it was powered by a Cummins 220 engine in line with a David Brown gearbox and the group axle which was the standard Pandoro set up at the time. "I purchased UTB 706M second hand through my agent R J & I Wells on the 31st of January 1978 along with three others at a cost of £4,550 each plus vat". 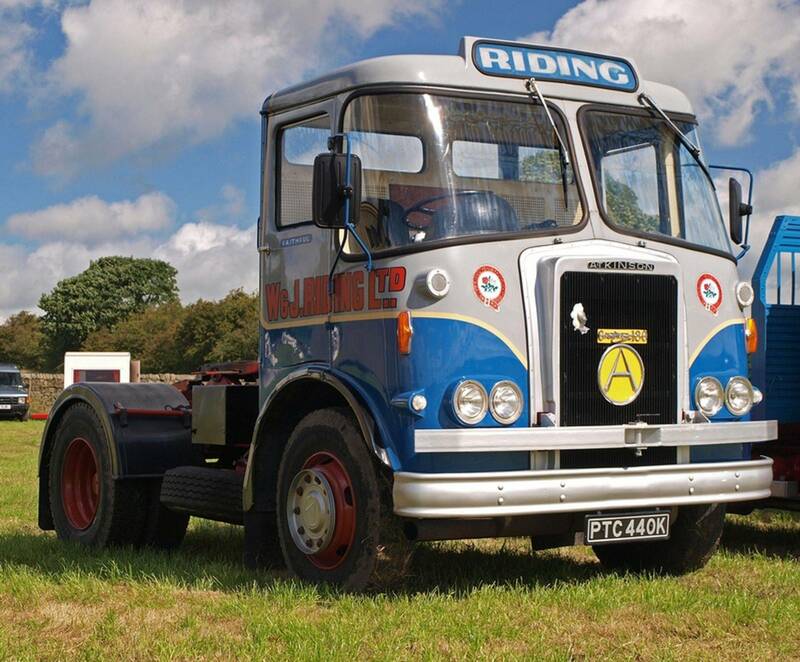 After being in service with Riding's for four years UTB 706M was eventually sold on to Warren Jones of Kirkham on the 2nd of January 1982 for £1,050 plus vat. Today UTB 706M is still very much on the road and can be seen out and about at various rallies across the country persevered in the livery of A Bradshaw & Sons. 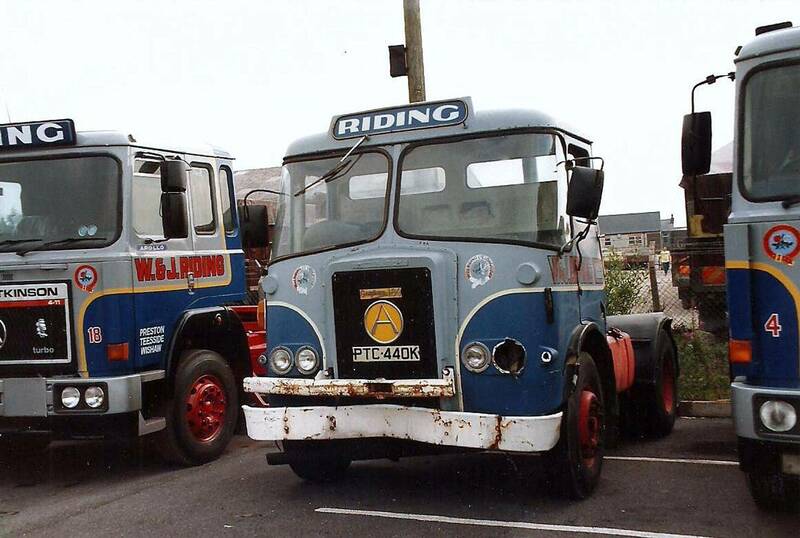 Seddon Atkinson 400 Series 4x2 tractor unit Reg No SFR 950P Fleet No 49 'Peerless' was registered new by Riding's on the 1st of August 1976. Driven from new by Bill Coolican it was powered by an eight cylinder Gardner 240 engine. 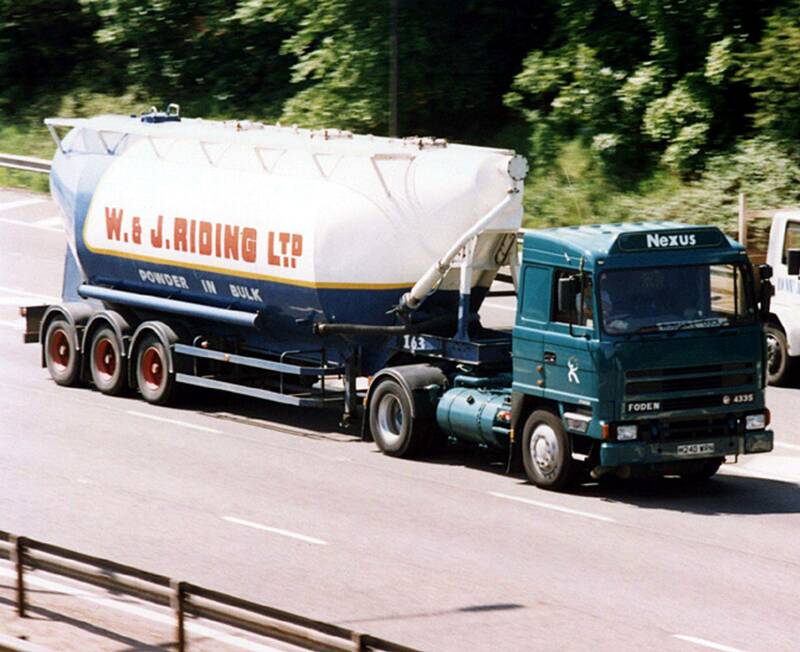 Seen here pulling a 1450 cubic foot Crane Fruehauf non tipping tandem axle powder tanker this superb colour photograph was taken by the renowned lorry photographer Peter J Davies. Seddon Atkinson 400 Series 4x2 tractor unit Reg No SFR 950P Fleet No 49 'Peerless' is pictured here towards the end of it's working life with Riding's. Note some changes since it joined the fleet in 1976 including revised livery, the addition of a sun visor and also the re-positioning of the exhaust system behind the cab. 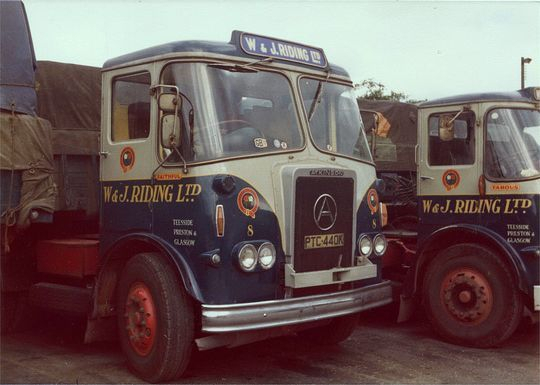 After many years service with W & J Riding Reg No SFR 950P 'Peerless' was eventually sold on to Tom Riding's close friend John Killingbeck of Blackburn where it became Fleet No 25 in John's mixed and varied fleet. Note the cosmetic change to the front with the old rust ridden '400 Series' grille being replaced by a '401 Series' grille, a nice quick easy fix as many Seddon Atkinson parts were easily interchangeable over different models. Seddon Atkinson 400 Series 4x2 tractor unit Reg No ERH 554T Fleet No 29 'Britannia' was registered new on the 1st of April 1979. Powered by a Cummins E290 engine this particular tractor unit, when new, had been originally supplied to fellow TDG company Gilyott & Scott of Kingston upon Hull. "Gilyott & Scott decided to pull out of general haulage and i heard on the grapevine that four of their tractor units were for sale at book value. I shot across to Hull and liking what i so bought ERH 554T at a cost of £11,300 plus vat on the 30th of November 1981". 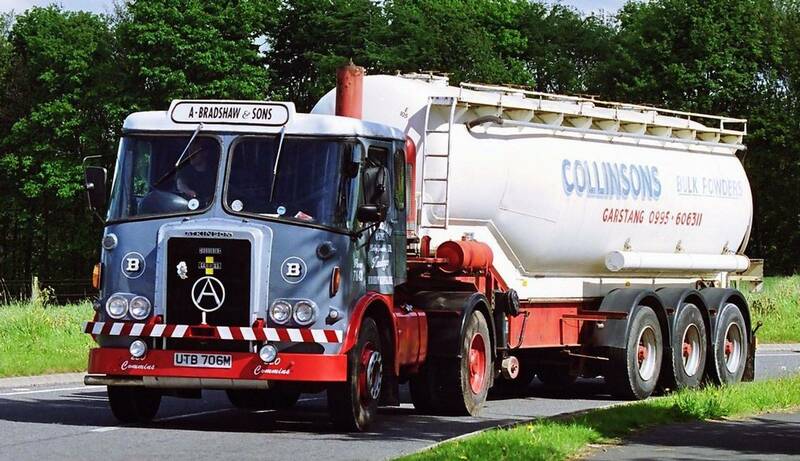 It was sold on the 4th of June 1988 for £3,000 plus vat to a J.A.Collins of Bognor Regis. 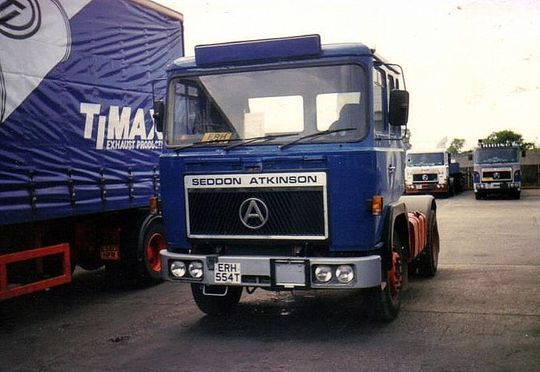 Seddon Atkinson 400 Series 4x2 tractor unit Reg No ERH 554T, formerly Fleet No 29 'Britannia' in the Riding fleet, was sold on the 4th of June 1988 for £3,000 plus vat to a J.A. Collins of Bognor Regis. The photograph above shows it just before it left Longridge depot destined for Bognor Regis, having been cleaned up and given an all blue livery in Riding's paint shop. 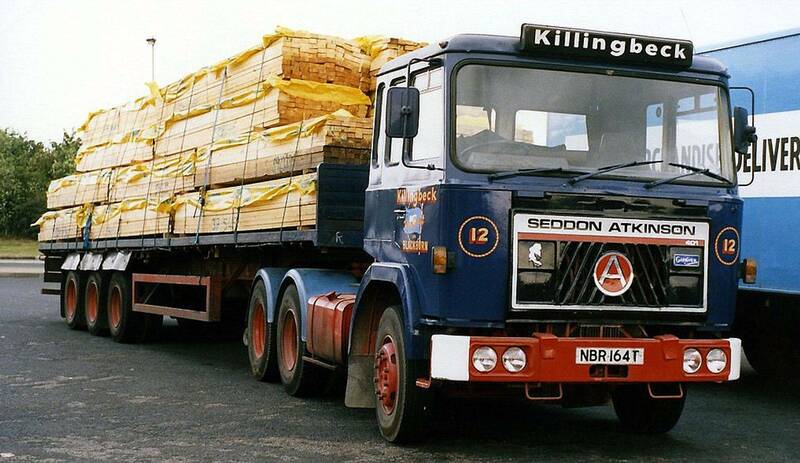 Seddon Atkinson 400 Series 4x2 tractor unit Reg No NBR 164T Fleet No 15 'Black Douglas' was powered by a Gardner 240 eight cylinder engine. 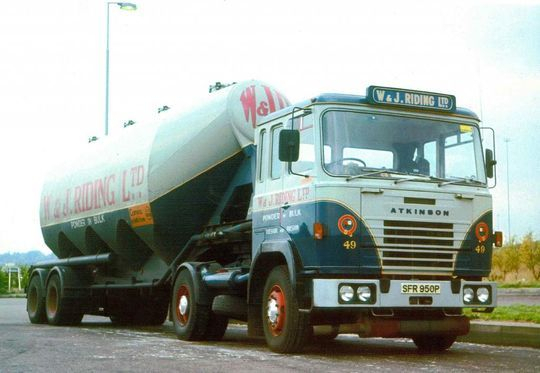 Originally registered new on the 11th of April 1979 Tom Riding bought this particular tractor unit when it was four years old from S. Hartley of Whittingham in January 1983 for £9,400 plus vat. Having spent its life with Riding's on general haulage NBR 164T was finally sold on to John Killingbeck of Blackburn for £2,700 plus vat on the 30th of June 1987. 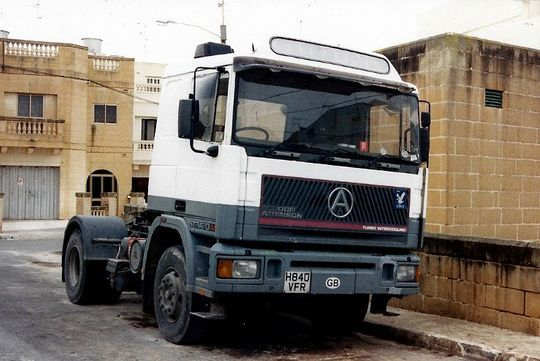 Doctor John then worked his magic on the machine and it emerged as a full bloodied double drive 6x4 tractor unit as can be seen in this picture above. Over the years Tom Riding sold quite a number of vehicles to his good friend John Killingbeck down the road in Blackburn. John was the master at engine rebuilds and also converting 4x2 tractor units into 6X2's and 6x4's. The picture above, taken in John Killingbeck's yard at Blackburn, shows some ex Riding Seddon Atkinson '400 Series' tractor units along with a couple of 400 Series cabs on the back of a trailer. 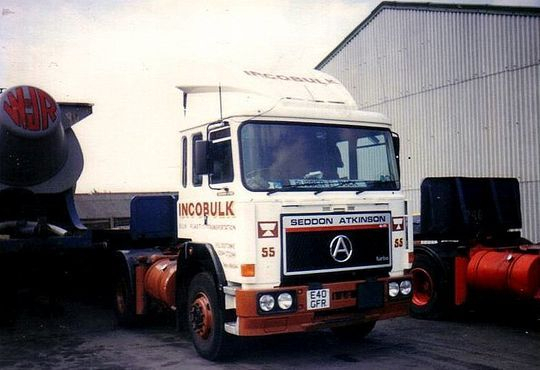 Seddon Atkinson 4-11 4x2 tractor unit Reg No E40 GFR Fleet No 55 'Rising Star', powered by a Gardner 290 LXDT engine, was originally assigned to the Incobulk contract when brand new. Registered new on the 1st of September 1987, at a cost of £28,716 plus vat, it remained in W & J Riding's fleet for a total of eight years. 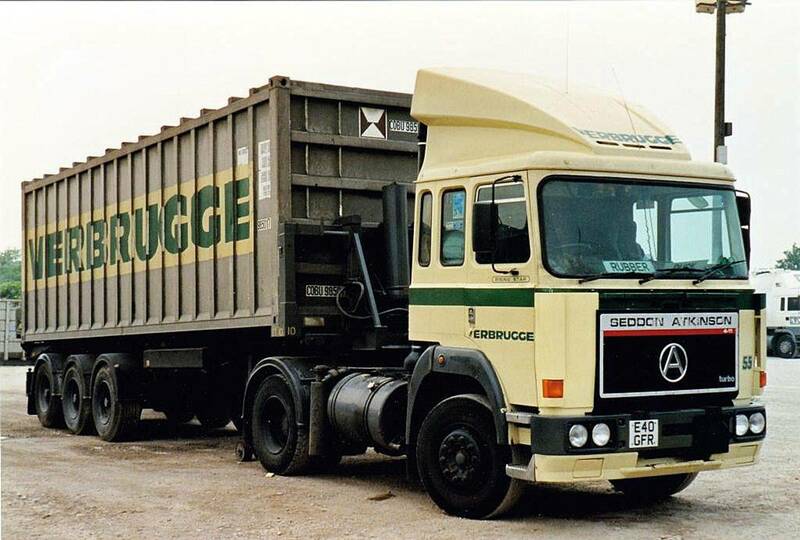 After couple of years Seddon Atkinson 4-11 tractor unit Reg No E40 GFR Fleet No 55 'Rising Star' was repainted and allocated to the Verbrugge contract in 1989. It remained in service for a further six years until it was sold on to local dealer Syd Hartley for £2.600 plus vat on the 6th of June 1995. After being sold on to local dealer Syd Hartley, for £2.600 plus vat on the 6th of June 1995, Seddon Atkinson 4-11 4x2 tractor unit Reg No E40 GFR was later bought by France and Wood of Marsden near Huddersfield. 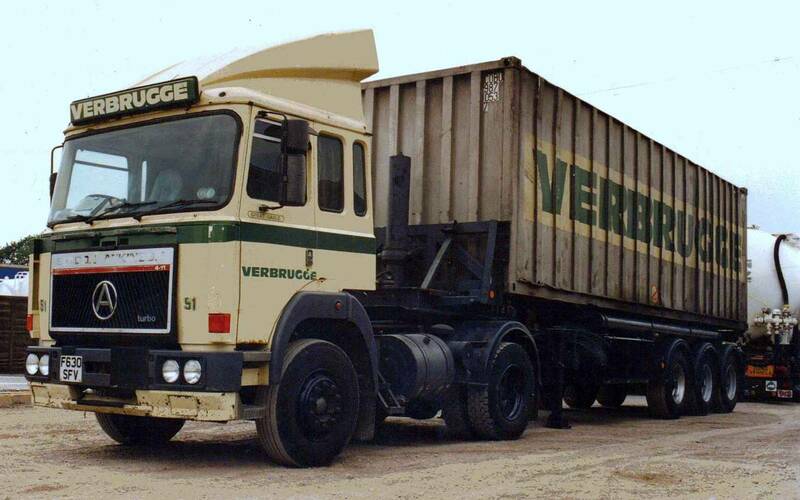 They ran it on general haulage for four years until it was finally withdrawn and scrapped in 1999. Seddon Atkinson 4-11 4x2 tractor unit Reg No F630 SFV Fleet No 51 'Great Gable' was driven by David Ireland. Registered new on the 1st of August 1988, at a cost of £28,878, it was assigned to Riding's Verbrugge contract where it remained in service for eight years. Seddon Atkinson 411 4x2 tractor unit Reg No F630 SFV, formerly Fleet No 51 'Great Gable', is seen here at Blackburn in 1997 after being withdrawn from W & J Riding's fleet the previous year. 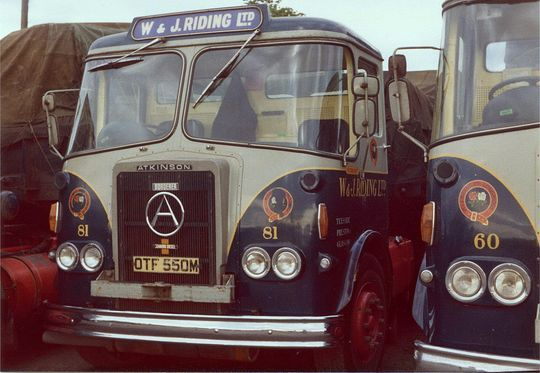 Originally purchased brand new by Riding's on the 1st of August 1988, at a cost of £28,878, it remained in service with Riding's for a total of eight years. 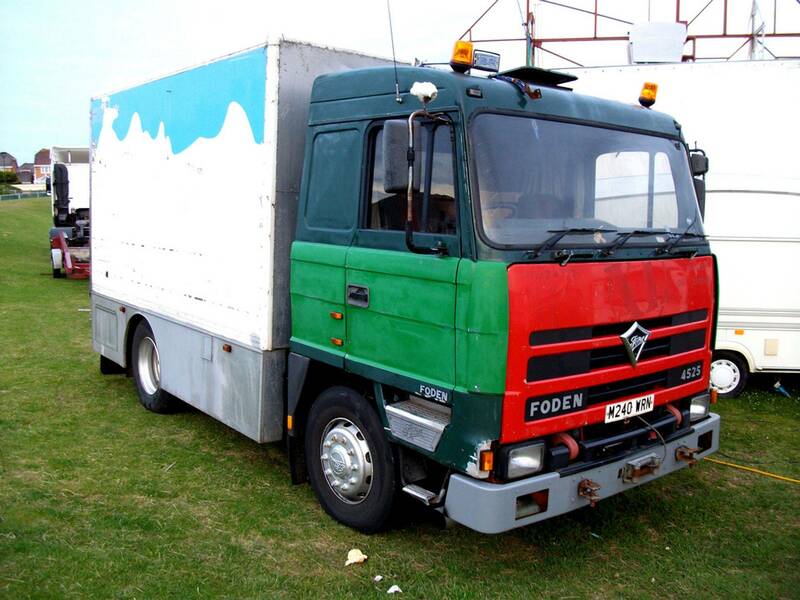 In 1996 F630 SFV was sold on to local commercial vehicle dealer Sid Hartley for £2,300 who in turn sold it on to a local fairground operator. 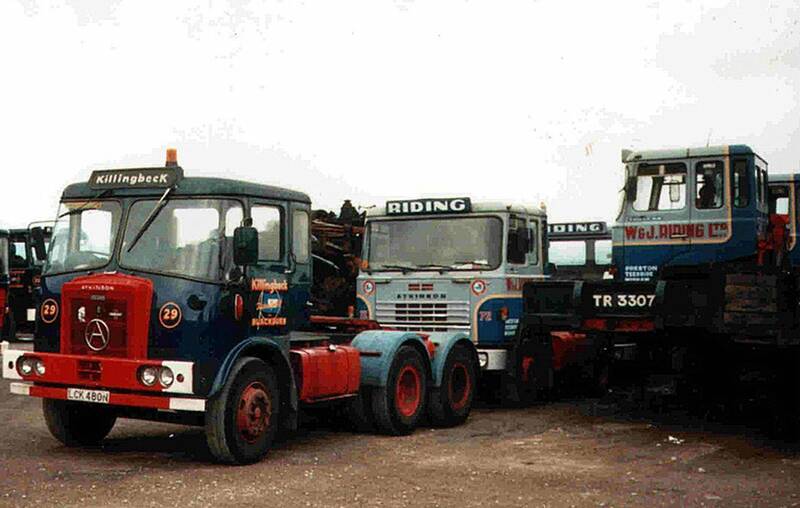 Seddon Atkinson Strato 4x2 tractor unit Reg No G26 LRM Fleet No 82 'Sir Lamiel'. Registered new on the 29th of August 1989 it is pictured here when in Riding livery parked up in Penrith while coupled up to a forty foot tri-axle flat trailer loaded with a 24 ton load of bagged cement from the Castle Cement plant at Clitheroe. 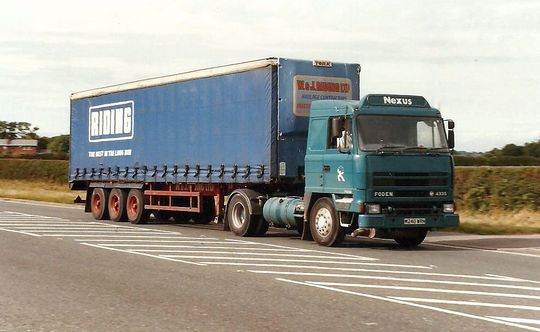 Pictured here on the 25th of September 1997, some two years after the retirement of Tom Riding, Seddon Atkinson Strato 4x2 tractor unit Reg No G26 LRM is seen here on the A585 on the run up to Junction 3 of the M55. Both tractor unit and curtain sider trailer are now in the TDG Group scarab green Nexus livery. 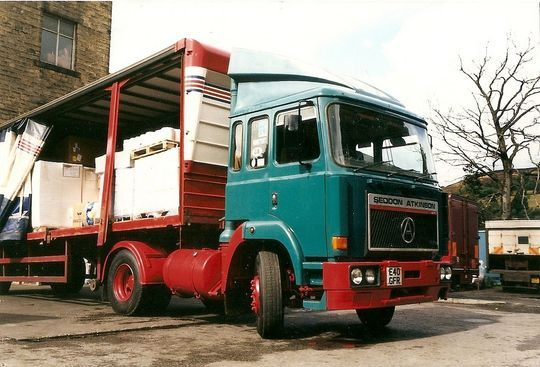 Day cabbed Seddon Atkinson Strato 4x2 tractor unit Reg No G921 UYV was registered new on the 1st of December 1989 and originally operated by Esso. 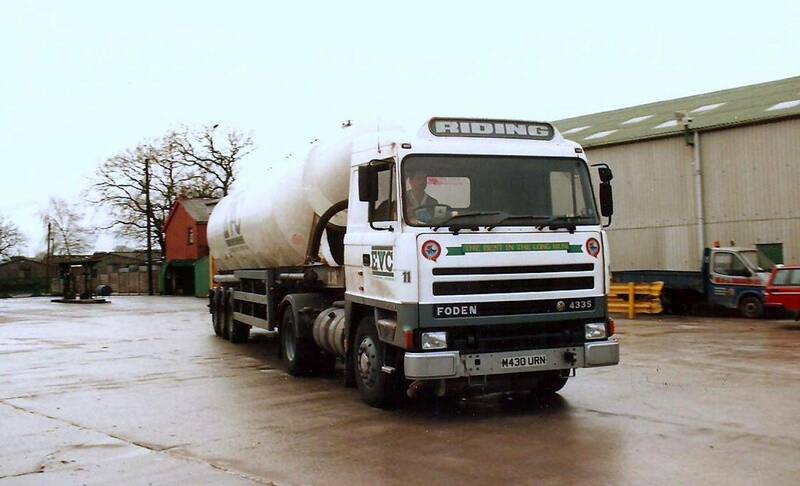 On the 8th of March 1993 Tom Riding bought it off Seddon Atkinson for £12,000 + vat after a three year buy back scheme that Esso had with Seddon Atkinson. Powered by a L10 325 Cummins engine it was one of several low mileage former Esso 4x2 tractor units bought by Riding's at that time. G921 UYV went into the paint shop and shortly after this picture was taken it emerged as Fleet No 81 'Dominant' which can be seen in the picture below. Day cabbed Seddon Atkinson Strato 4x2 tractor unit Reg No G921 UYV Fleet No 81 'Dominant', originally registered new to Esso on the 1st of December 1989, joined the Riding fleet in March 1993 when just over three years old. Normally based at Riding's Teesside depot it is pictured here at Longridge coupled to one of the company's standard 40 foot Crane Fruehauf tri-axle flat trailers. 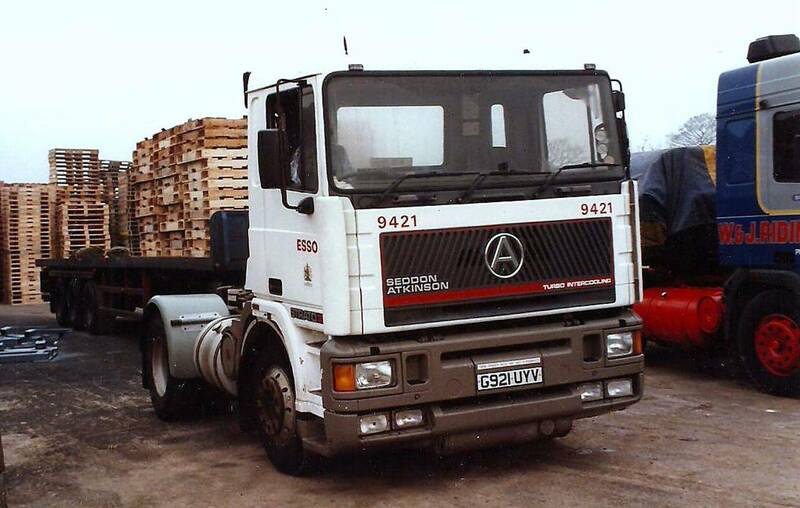 Seddon Atkinson Strato 4x2 tractor unit Reg No G921 UYV, formerly Fleet No 81 'Dominant' in the Riding fleet, is seen here on the 9th of July 1997 when eight years old after being sold on to a local operator. 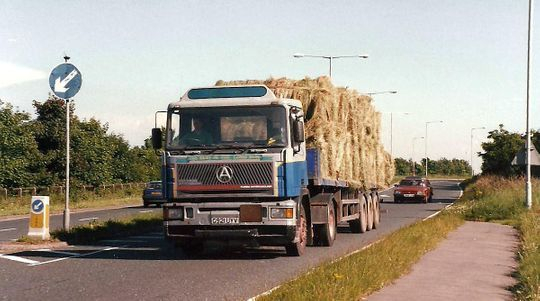 Having lost most of it's Riding livery it is pictured on the A535 adjacent to Junction 3 of the M55 in Lancashire hauling a load of hay, a great change from what it must have pulled in it's previous years. After this picture was taken G921 UYV kept on going for a further 13 years until it was finally scrapped in February 2010 when 21 years old. 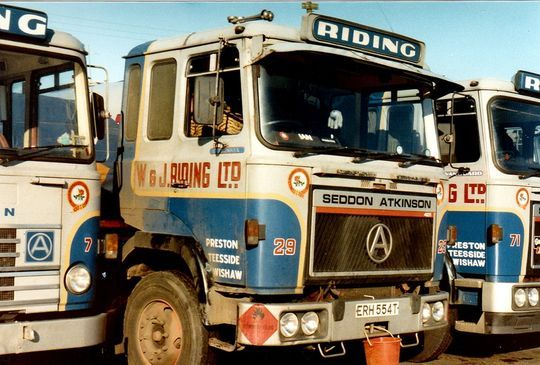 Seddon Atkinson Strato 4x2 tractor unit Reg No H840 VFR Fleet No 1 'Precursor', registered new on the 17th of August 1990, was painted in European Vinyls Corporation Ltd livery. This was the first Seddon Atkinson Strato Riding's had that was fitted with a Perkins TX engine and subsequently this engine proved to be very durable and very efficient. After being in service with Riding's for eight years Seddon Atkinson Strato 4x2 tractor unit Reg No H840 VFR was sold on in 1998 and exported to the Mediterranean island of Malta. Foden 4335 4x2 tractor unit Reg No M430 URN Fleet No 11 'Coeur-de-Lion' was registered new on the 1st of February 1995 at a cost of £39,750 plus vat. 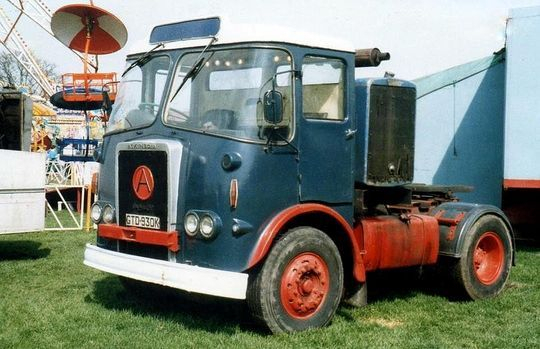 Powered by a Perkins 335 TX engine it was painted In the contract livery of European Vinyls Corporation Ltd.
After a spell at Miles Fox of Clitheroe M430 URN finished up on the fairground circuit as did many of the other Foden's in the fleet. M430 URN is pictured here when 15 years old being utilised as a generator at Bispham near Blackpool on the 17th of July 2010. Foden 4335 4x2 tractor unit Reg No M490 WFR Fleet No 63 'Great Britain' was registered new on the 1st of April 1995 at a cost of £39,750 plus vat. 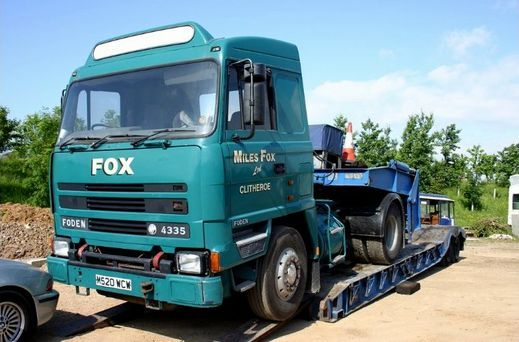 M490 WFR along with Riding's nine other Foden's in the fleet were originally sold on to Miles Fox of Clitheroe. 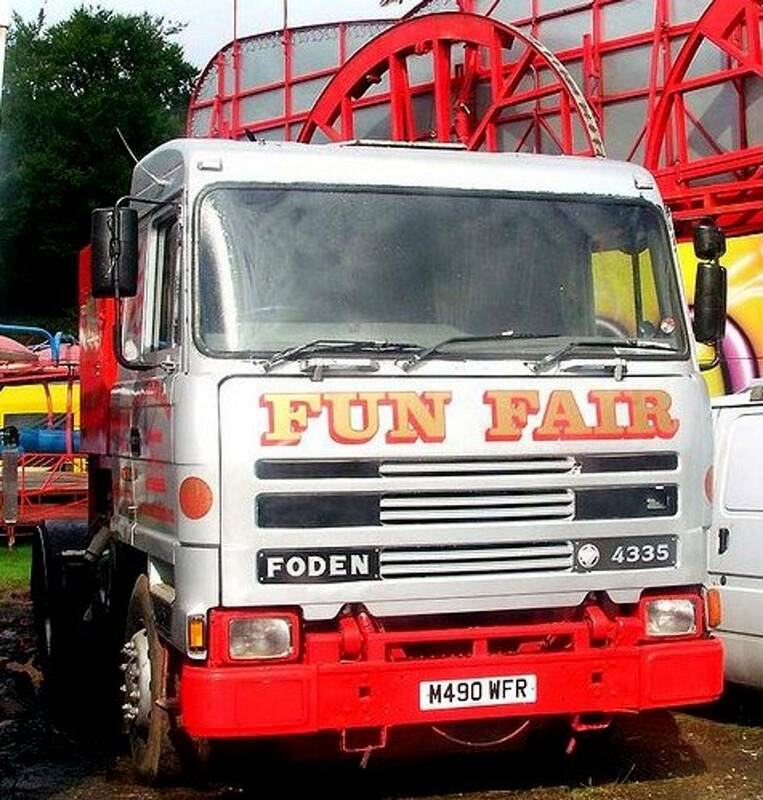 After a spell at Miles Fox M490 WFR was bought by a Lancashire fairground operator. It is pictured above when thirteen years old at Heaton Park Manchester on the 7th of September 2008. Photograph courtesy of Colin Billington. 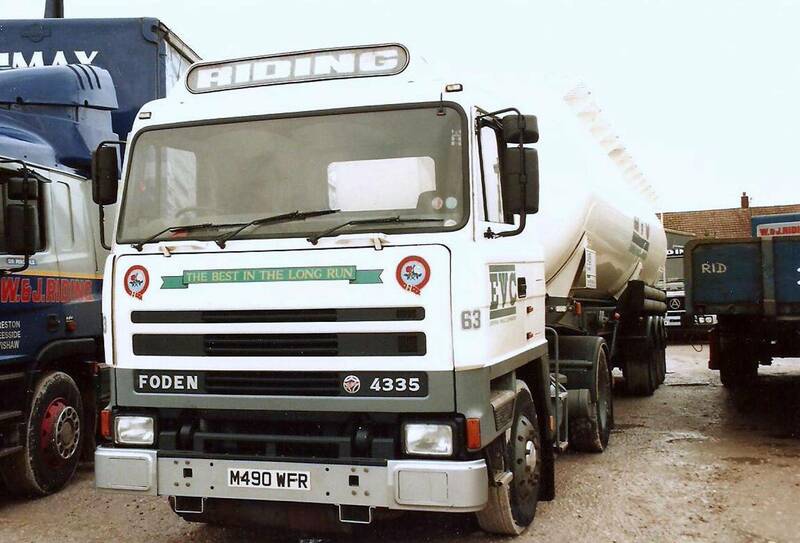 Foden 4335 4x2 tractor unit Reg No M240 WRN Fleet No 66 'Sir Winston' was registered new on the 1st of May 1995 at a cost of £39,750 plus vat. Foden 4335 4x2 tractor unit Reg No M240 WRN former Fleet No 66 'Sir Winston' is pictured here on the 22nd of August 1997 two years after the retirement of Tom Riding. 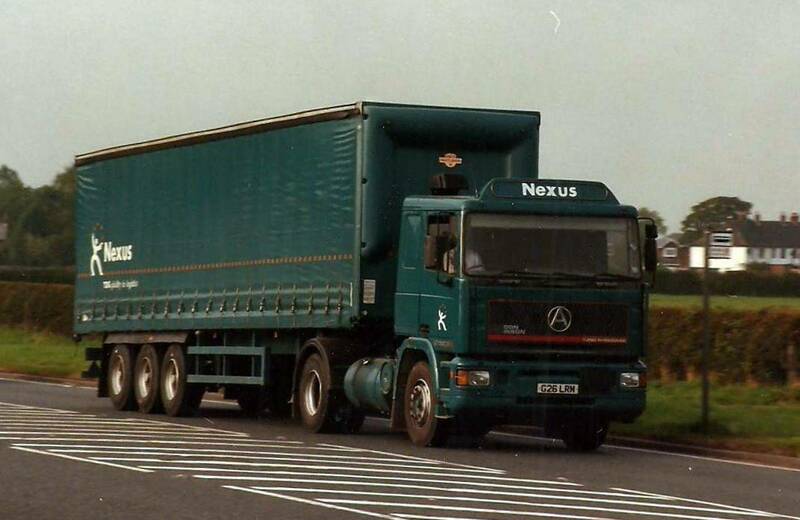 Now baring the TDG Group Nexus green livery M240 WRN is seen on the A585 approaching Junction 3 of the M55 in Lancashire hauling a tri-axle curtain-sider trailer still in Riding livery. A close up shot of Foden 4335 4x2 tractor unit Reg No M240 WRN,former Fleet No 66 'Sir Winston' in the Riding fleet, is seen here in Longridge depot on the 21st of June 1997 now in full drab TDG Group Nexus green livery. 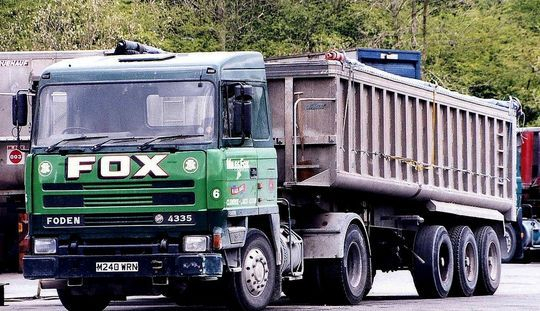 Foden 4335 4x2 tractor unit Reg No M240 WRN heads Northbound on the M6 passing Hilton Park Services in 1999 when four years old. Pictured hauling a Carmichael 2000 cubic foot tri-axle powder tanker, still in Riding livery, M240 WRN would later be sold on to Miles Fox of Clitheroe as can be seen in the picture below. Photograph courtesy of Ade Portlock. 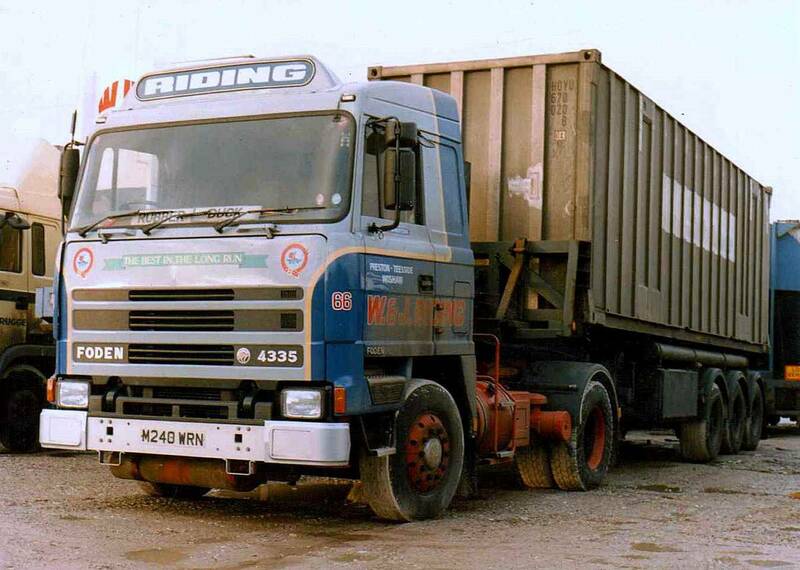 Like all the other Fodens in W & J Riding's fleet M240 WRN was eventually sold on to Miles Fox of Clitheroe where it was put to use hauling the company's tri-axle tipper trailers for a number of years. After being in service with Miles Fox of Clitheroe for a number of years M240 WRN was eventually sold on to a fairground operator were it was put to use as a prime mover/generator. It is pictured here on the 16th of September 2010, when fifteen years old, at Ashby-de-la Zouche fun fair. Photograph courtesy of Keith Halstead. The 2nd of April 2015 and M240 WRN was still on the road when 20 years old. It is seen here at Heaton Park Manchester been operated by John Collins Fun Fair. Foden 4335 4x2 tractor unit Reg No M520 WCW Fleet No 67 'Thane-of-Fife' was based at Longridge and driven from new by long serving driver Tommy Dewhurst. One of a pair of Foden's that Riding's registered new on the 1st of April 1995 it is seen here pulling a 2000 cubic foot Carmichael tanker used exclusively on the EVC contract. Photograph courtesy of Roy Beecher. 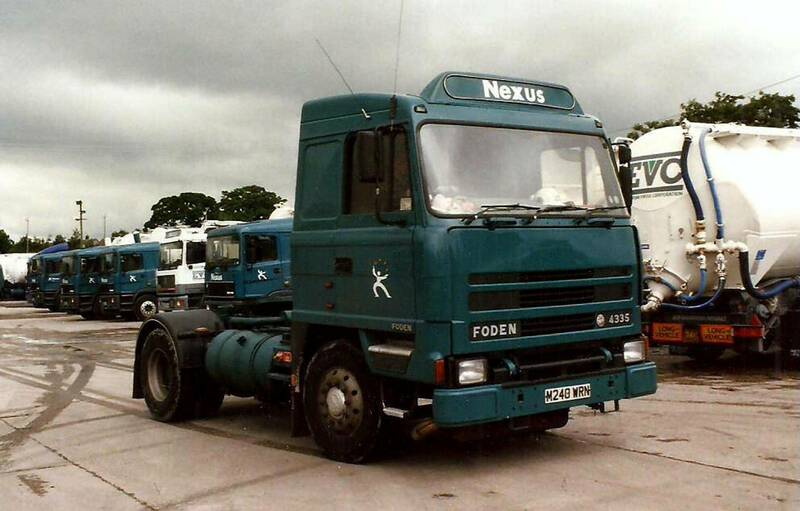 As with all the other nine Foden 4335 4x2 tractor units in the Riding fleet Reg No M520 WCW was sold on to local operator Miles Fox of Clitheroe. Pictured here coupled to a tandem axle tipper Miles Fox only added the company name to the doors and front grille, preferring M520 WCW to remain in blue TDG Nexus livery. 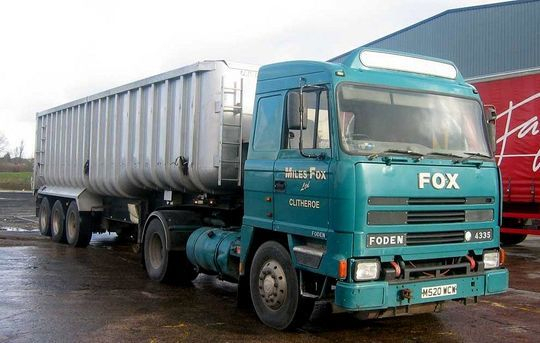 Today Foden 4335 4x2 tractor unit Reg No M520 WCW is still owned by Miles Fox of Clitheroe who uses it to transport some of his veteran lorries to various rallies. 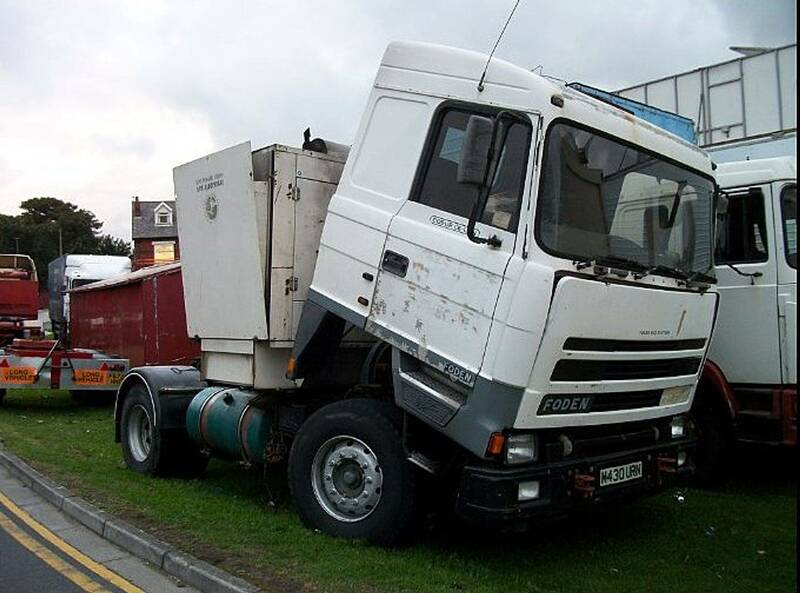 It is pictured here in 2005 parked up on its own low loader due to lack of parking space at an event. Photograph courtesy of Derrick Petty.